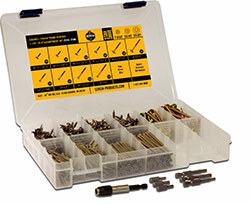 This economical and compact assortment kit is the perfect accessory for your home, garage or workshop. Fully loaded, this take-anywhere kit is easy enough to carry & slim enough to fit just about any place you need. The ultimate trim & finish head head assortment kit. Makes a perfect gift for the handyman in your life, Fathers Day, Christmas, any day can be special. This economical and compact assortment kit is the perfect accessory for your home, garage or workshop. Fully loaded, this take-anywhere kit is easy enough to carry & slim enough to fit just about any place you need. The ultimate in interior wood working!